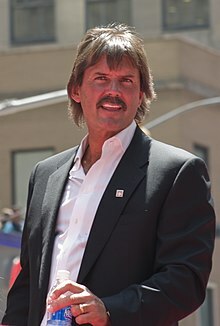 Dennis Lee Eckersley (born October 3, 1954), nicknamed "Eck", is an American former professional baseball pitcher. Between 1975 and 1998, he pitched in Major League Baseball (MLB) for the Cleveland Indians, Boston Red Sox, Chicago Cubs, Oakland Athletics, and St. Louis Cardinals. Eckersley had success as a starter, but gained his greatest fame as a closer, becoming the first of two pitchers in MLB history to have both a 20- win season and a 50- save season in a career. He is the pitcher who gave up a dramatic walk-off home run (a phrase Eckersley coined) to the injured Kirk Gibson in Game 1 of the 1988 World Series. The Indians traded Eckersley and Fred Kendall to the Boston Red Sox for Rick Wise, Mike Paxton, Bo Díaz, and Ted Cox on March 30, 1978. Over the next two seasons, Eckersley won a career-high 20 games in 1978 and 17 games in 1979, with a 2.99 ERA in each year. However, during the remainder of his tenure with Boston, from 1980 to 1984, Eckersley pitched poorly. His fastball had lost some steam, as demonstrated by his 43–48 record with Boston. He later developed a great slider. Eckersley was traded again on April 3, 1987 to the Oakland Athletics, where manager Tony La Russa intended to use him as a set-up pitcher or long reliever. Indeed, Eckersley started two games with the A's before an injury to then-closer Jay Howell opened the door for Eckersley to move into the closer's role. He saved 16 games in 1987 and then established himself as a dominant closer in 1988 by recording a league-leading 45 saves. Eckersley recorded 4 saves against the Red Sox in the regular season, He dominated once more by recording saves in all four games as the A's swept the Red Sox in the 1988 ALCS. (which was matched by Greg Holland in the 2014 ALCS), but he found himself on the wrong end of Kirk Gibson's 1988 World Series home run (Eckersley himself first coined the phrase " walk-off home run" to describe that moment) as the A's lost to the Dodgers in 5 games. When La Russa left the Athletics after the 1995 season to become the St. Louis Cardinals' new manager, he arranged to bring Eckersley along with him. [ clarification needed] Eckersley continued in his role as closer and remained one of the league's best, but following the 1997 season, he signed on with the Red Sox for one final season. In the spring of 2009, when regular NESN commentator Jerry Remy took time off for health reasons, Eckersley filled in for him, providing color commentary alongside play-by-play announcer Don Orsillo. Since then, Eckersley has been the primary substitute for Remy when he is unavailable, including filling in for the final two months of the 2013 season, when Remy took extended time off due to the murder indictment of his son, Jared. Eckersley has continued to work with Orsillo's successor, Dave O'Brien, for various Red Sox games in 2016, 2017, and 2018 as Remy has decreased his on-air schedule, mostly due to health reasons.